1994 Fleer Ultra Beavis and Butthead trading cards are dedicated to the pair of animated idiots that were a big part of pop culture in the early- to mid-1990s. Focusing on fun more than logic, it can be a little tricky to figure out, although this is totally intentional. The base set has 150 cards. Most focus on specific episodes. Things get confusing when it comes to numbering. The first 100 cards have "69" after the set number. To further complicate matters, it kicks off at 0069. The final 50 base cards have the "69" at the start, going from 6901 through 6950. Standard for the Ultra brand, cards have a more premium standard for the time. This includes small gold foil accents on the fronts. 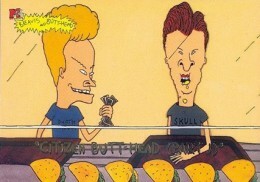 1994 Fleer Ultra Beavis and Butthead has just one insert set, Scratch 'n Sniff. Falling 1:4 packs, there are ten cards in the set. Boxes come with 36 packs of five cards. A similar set was released in Europe by Topps. The checklist has 132 cards, not 150. Besides the trademarks, the easiest way to differentiate the Topps set is its purple borders. 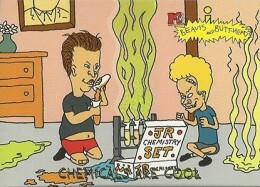 Beavis and Butthead also appeared in 1995 Fleer Ultra MTV Animation. This set includes cards from a handful of other shows including Aeon Flux and The Maxx. 6921 Mary Had a Dah Dant Dah! 6927 You Gonna Buy That? 1994 FLEER ULTRA Beavis and Butthead SCRATCH N SNIFF INSERT 10 Card SET MTV!